gOS Rocket is a Linux distribution created by ‘Good OS LLC’, a Los Angeles-based corporation. 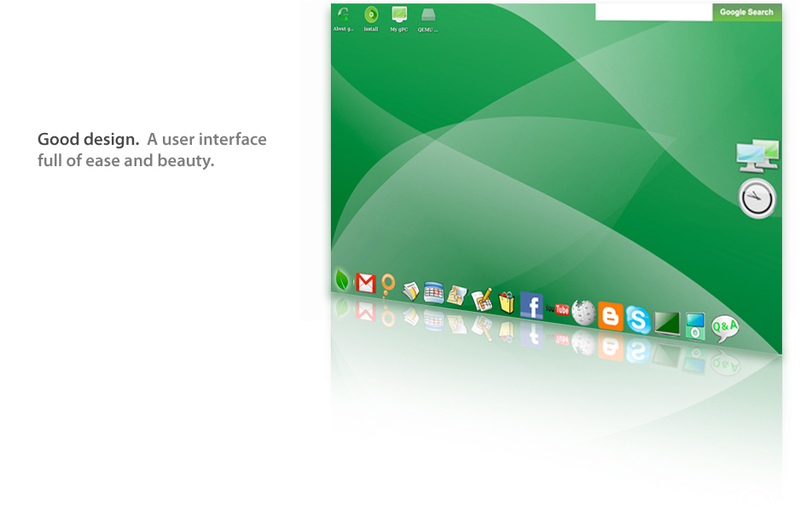 The company advertises it as “An alternative OS with Google Apps and other Web 2.0 apps for the modern user. gOS Rocket is based on the Ubuntu 7.10 distribution. It uses the Enlightenment 17 window manager instead of the usual GNOME or KDE desktops, allowing for lower memory and speed requirements. — The Ubuntu Linux-based gOS operating system from Good OS LLC (www.thinkgos.com) includes so many Google applications like Gmail, Google Docs, Google Calendar, Google News Google Maps and YouTube that it’s often referred to as the Google operating system. It also includes Firefox, Skype, Facebook and OpenOffice 2.3. Google did not develop this OS. Good OS LLC did. They’re not the same company, nor are they conglomerates or affiliated in any way. Anyway. gOS is interesting, but it’s not ready for people to use. It’s still pretty buggy. In my opinion, even the first release (NOT Rocket, which is still advertised as Beta) is still in Beta. Yes. You are right. I am changing the entry. thanx..
You cant call “New OS”…. infact a new distro ….. In linux any distros, you can only see Gnome or KDE … but never less Enlightenment. But what this GOS , is done to give you brighter for Enlightenment.